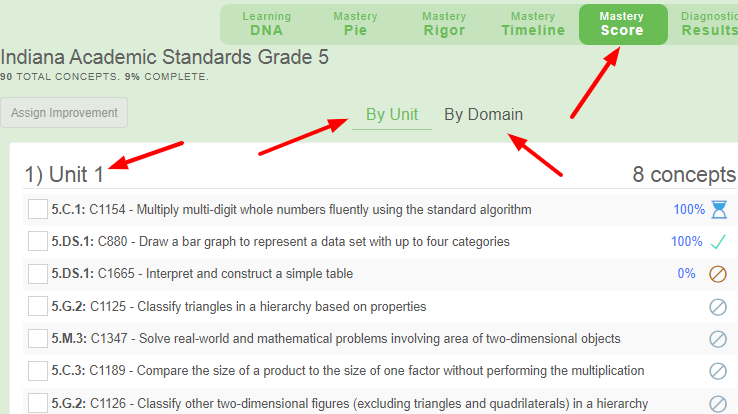 As Learning Paths are customized to match your pacing guides and curriculum maps, these 2 views accessible from the Adaptive Practice dashboard will allow you to clearly see student Mastery along their journey unit by unit. Haven’t customized a Learning Path yet? Click here to learn how! This is a game changer and a time saver. 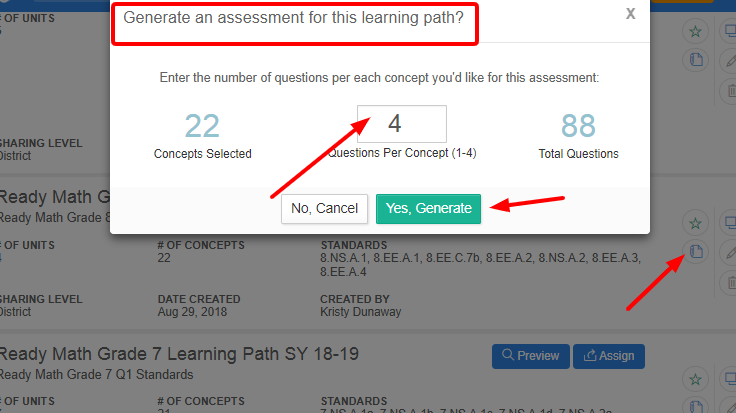 From any Learning Path (including your own), you now have the ability to generate an assessment from it in a couple clicks. Click here to learn how! This enhancement was inspired by the amazing staff at Union School District in Pennsylvania, the awesome admins at ACCEL schools in Ohio and countless other teachers and administrators. Way to go guys! When you need to edit a custom Learning Path, it’s important that the concept order you had in place previously is preserved. Thanks to some power users in Delaware City, Ohio and Griffith, Indiana this is now available! Click here to read about it. This new enhancement is indeed a time saver. 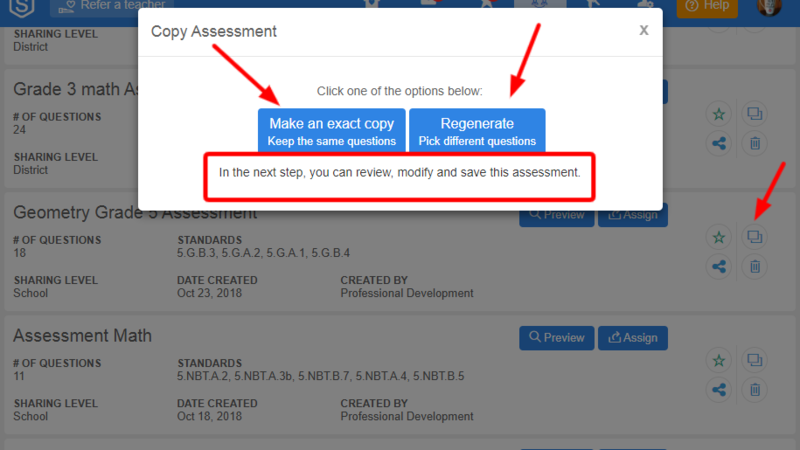 Simply click the Copy icon for any assessment to make an exact copy or regenerate a copy with different questions. The teachers and admin team in Spirit Lake Middle School, IA and Van Nuys Middle School, Los Angeles Unified contributed the feedback for this enhancement! What a great idea! Check it out by clicking here. Admins, this one is specifically for you! 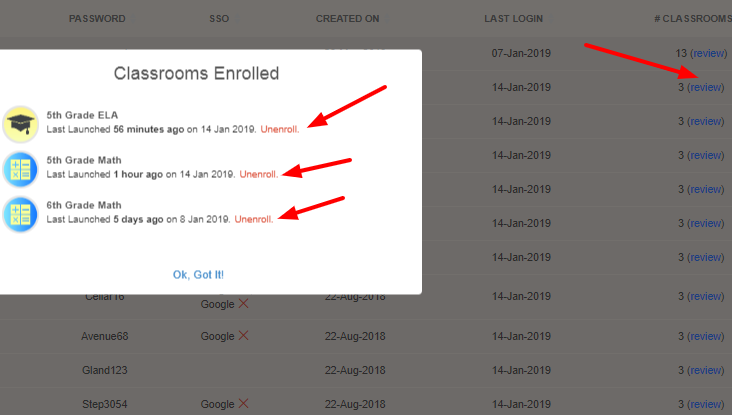 Under Manage students, you can now easily see all of the classrooms your students are enrolled in and unenroll in 2 clicks! Click here for the updated article. A second one for our wonderful admins! When you assign assessments, the ability for you to view results broken down by individual classrooms is super important! Also, results are displayed as students complete the assessment versus alphabetical order, ensuring no gaps! Thanks to the countless number of admins who requested this enhancement! We appreciate you!